The Labels button toggles the display of source labels in the Plaque window. Labeling options may also be accessed by control-clicking (or right mouse button) the Labels button. 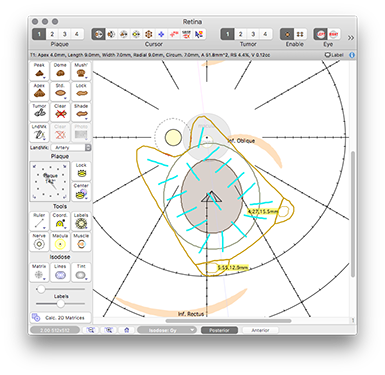 The source labeling Options menu is accessed from the Plaque Menu or the Labels button found in the Plaque Window. Source Contributions - Overlays each source with its % contribution to the total dose at, optionally, the Rx point, fovea, optic disc, and/or if available, a selected user point of interest. 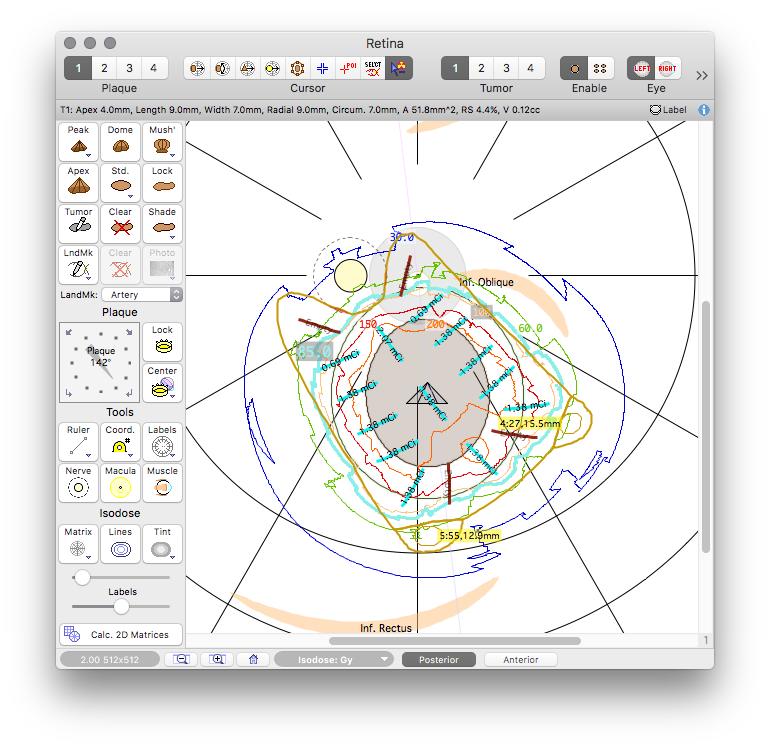 Enable to identify which seeds contribute significantly, or not, to critical points when developing optimization strategies such as source intensity modulation. Rx Pt. Contribution - Include source contributions to the Rx point. Fovea Contribution - Include source contributions to the fovea. 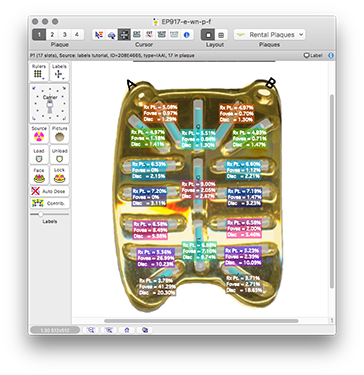 Disc Contribution - Include source contributions to the disc surface. POI Contribution - Include source contributions to a selected point of interest. Maybe you are treating a tumor that is adjacent to the disc and fovea, but both of these critical sites are outside of the tumor base expansion (e.g. 2 mm) margin. You may be able to dosimetrically spare these sites by intensity modulating the sources which are the strongest contributors to the dose delivered to these sites by tightening retinal coverage as much as practical along the posterior margin. Another example might be, when using a notched plaque to treat a peripapillary tumor that overlays the disc, you may want to assure Rx dose coverage skimming over the disc. This often requires intensity modulating the seeds that contribute to the disc surface dose. There is no point to intensity modulating seeds that do not contribute to the disc dose due to collimation. 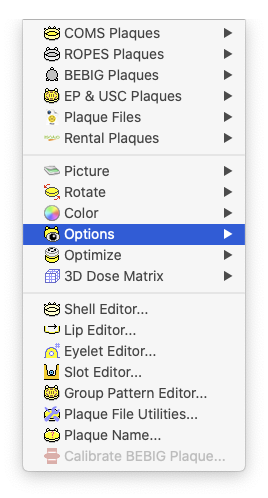 Enable source label display by clicking the Labels button in the Plaque window. 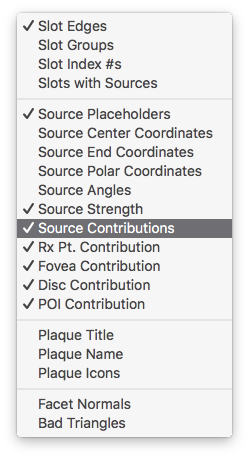 Enable source contribution labeling, and whichever contributions you are interested in, from the options menu (either the hierarchical menu attached to the button or from the Plaque menu) and be sure to load some sources into the plaque. Source contributions can not be calculated for empty source placeholders. Begin with uniform intensity sources, and then manually delete and/or intensity modulate the sources which contribute the greatest fraction of the total dose delivered at the site of interest until you acheive the desired dosimetric coverage. 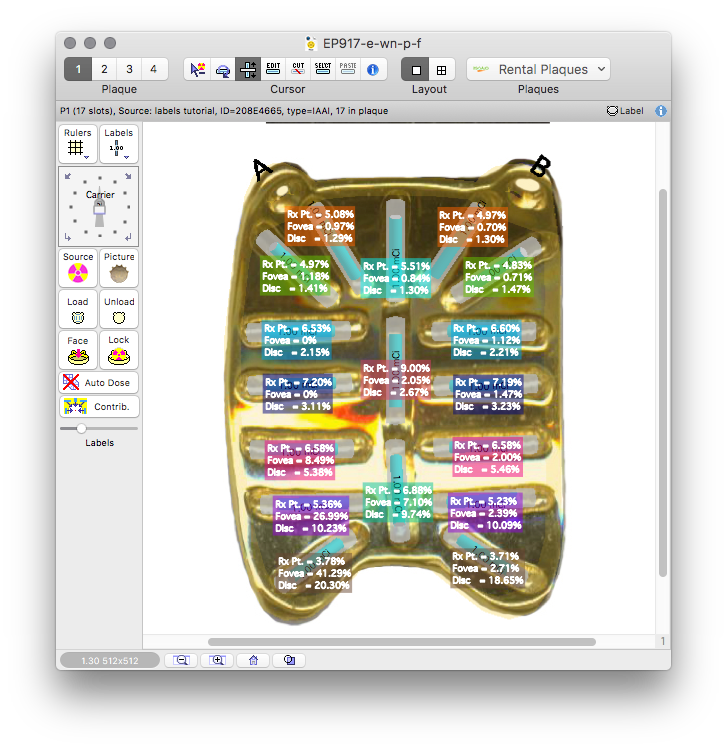 The best way to intensity modulate a plaque is to create multiple radionuclide inventories with different initial relative source strengths (e.g. 1.0, 1.5, 2.0) and then replace sources of interest (as determined by their contributions) in the plaque with sources from these new inventories. Then recalculate the source strengths required to achieve the Rx and track coverage using the retina dose area histogram and isodose plots.